With a volcano erupting and all UK airports still closed the day before departure, it was a miracle that I managed to get out of the UK on her scheduled flight. Unfortunately some clients weren’t as lucky and several chose to stay home for fear of being trapped somewhere as had been the fate of many others. The Amsterdam trip exists because not only is Amsterdam fantastic for skaters in terms of skating provision, road safety and smooth concrete, one of my best friends lives in Amsterdam and this trip is the opportunity to see her once a year. 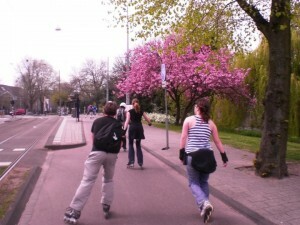 The tour officially began on Friday 23rd April at 6.30pm in Vondelpark, ready for the Friday night skate. 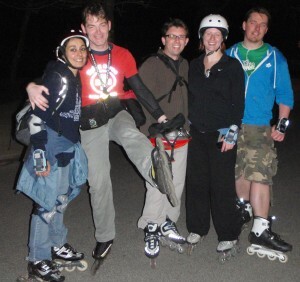 Our group of Min Saw, Ofran, Mike and Deb quickly met and bonded during the skate. I was delighted to see the radical transformation in Ofran’s skating as last year she hadn’t been skating for long when she did the Amsterdam FNS and worried me throughout with her straight knees. No such trouble this year. The route was pleasant, it had long sections of very smooth concrete and wider cycle paths both in and what felt like outside of the city. For Deb this was the first time back to skating after some skate-free months and we were impressed by her determination to improve although this did lead to a new rule introduced by her: No-one was allowed to do a lunge turn in front of her (or anywhere near her – in fact just not at all, cause she will notice if you do it behind her back) as she hasn’t mastered the art just yet. 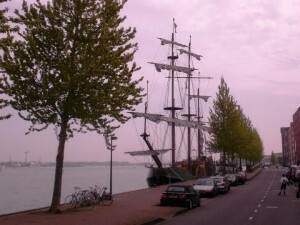 We arrived back and headed for chips and mayonnaise….proper Dutch style: “Lekker”. We awoke to clear blue sky and the promise of a great day. No wind, pure sunshine: Ideal skate conditions! 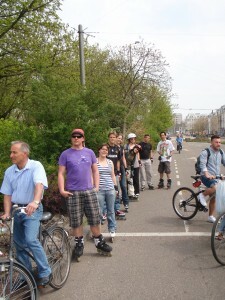 We headed East from Vondelpark, but not without a stop at Bart’s skate shop on Centuurbanstraat 59. This year I managed to restrict myself to 3 pairs of pink laces and flashy dynamo lights. 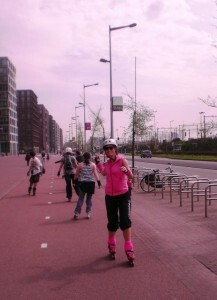 We continued east past Oosterpark and then hit the first of our 2 bridges (ie hills). This immediate change in landscape gave us a view of the harbour and more industrial area to the west and the flatlands with reed beds, reclaimed land and agriculture to the east. After the bridges we turned off and suddenly found ourselves on the quiet countryside roads between fields of horses and cows and small villages of huge houses with large gardens. 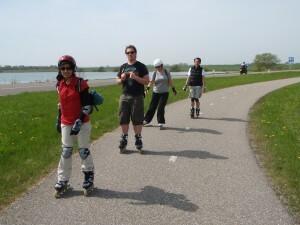 The freedom of skating in the countryside on roads with few cars (but more bikes) is wonderful after the confines and intensity of urban skating (which is the norm for all of us). 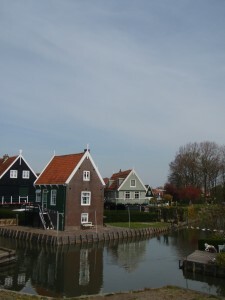 The trek to Marken is a gorgeous skate, following the coast line north east of Amsterdam, often skating on a raised cycle path with a view of the water (often on both sides of the path). The 3 wind turbines in the long distance come gradually closer until they are suddenly upon us, making you realise the distance you have skated. This perspective of distance travelled is always missing in the urban skate environment, and really makes one appreciate how fast you are on wheels. We had our own Asbox in the shape of my music system in a string bag. This caused a few raised eyebrows from the locals. The only mishap of the day was Ofran being pulled off her skates by a passing cyclist who somehow got her rucksack caught and literally pulled her off her skates backwards. Luckily the rucksack strap broke and Mike did a brilliant job of tying it back together again. Ofran’s ‘rubber bones’ held up well, but it was a very freaky and unusual accident. 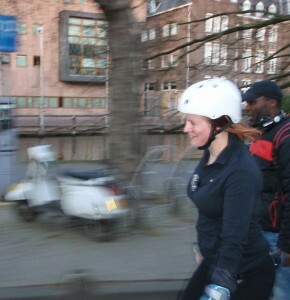 Surprisingly (for the Dutch are usually so convivial) the cyclist didn’t even stop. 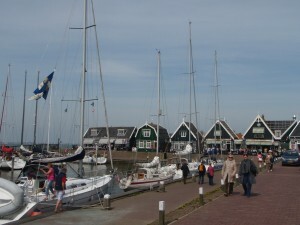 Marken is a gorgeous little island with a bustling harbour and cute, toy town-esque scenery. Here we found a large clog, perfect washing on the line and a sunny outdoor spot for lunch (everyone had salmon) finished off by ice cream and a return trip on the ferry to Vollendam and then bus back to Amsterdam. 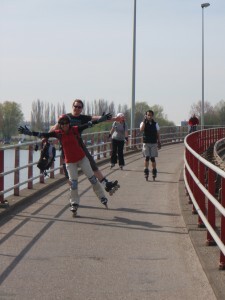 We then skated from Centraal station back to our hotels near Vondelpark, happy, tired and with acheing cheeks from the hilarious banter going on all day (including the values of Ofran and Mike’s 3 fingered shower ! ),which Asha couldn’t resist any further and went to try out before Saturday’s dinner. We hit Chinatown and The New King restaurant (along with what seemed like the rest of the city). The long queues even with a reservation gave testament to the quality of the food and the stories of perfect prawn toast were told to keep up focused as extreme hunger mixed with the tiredness. Silence fell as we all ate and enjoyed….. No photos of that due to the extreme level of satisfaction and hands being busy devouring great food. Unbelievably the group the hit the fairground rides of Dam square and one particularly high spinny contraption which made me feel ill just thinking about it (after such a meal). Good sleep guaranteed. 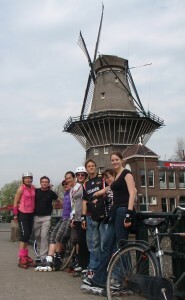 We met once again at 9.30am in Vondelpark for our city tour of Amsterdam. This large circuit of the city takes in various different neighbourhoods, several parks, busy shopping streets, the harbour area to the north and a smooth ride back to the park. We were joined by several additions to the trip on Sunday, Andrew and Katie (my brother and sister) and Fabiola (my PA) who all came to enjoy the city and skate. Our Amsterdam Brit Andrew also came along for the ride having sky-dived out of a plane the day before (and only lasting 46 seconds, we expected longer! ) 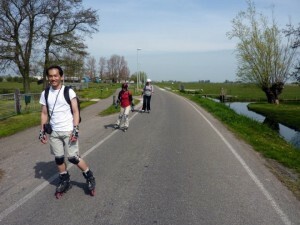 It was great to watch Min Zaw achieve his goal of ‘skating backwards in Amsterdam’. Min Zaw contacted me in the summer of 2009 having watched a video of me skating in Amsterdam and said he wanted to do the same things and skate well backwards on street skates. There began a winter/spring project of lessons and practice which all paid off as Min Zaw was skating backwards very frequently during the entire weekend, keeping up with normal forwards speed. This is difficult and unusual. Most people learning to skate backwards get stuck at low speeds and never master it fully. Min Zaw should be as proud as his teacher. 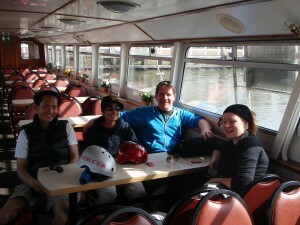 We stopped for lunch at Jay’s juice bar and later for pancakes and profitures at the great café in front of the Heineken brewery. A final loop around the posh area east of the park and then we were done. Back in Vondelpark with the hordes of people enjoying the hottest weekend of the year so far. Our timing was perfect. 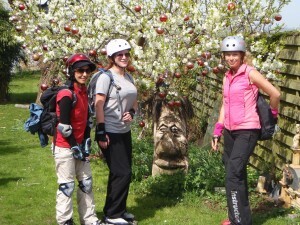 We were rewarded with great weather, fun people and fantastic skating. Roll on next year when we can do it again! 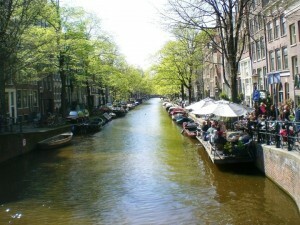 One Response to "Amsterdam Skate Trip April 2010"